The Funky Felter: Funky Finds finds the funky felter! Cupid Strikes! Funky Finds finds the funky felter! Cupid Strikes! 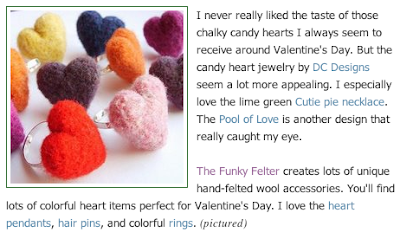 I was pleasantly surprised to be notified by the fab blog Funky Finds that my felted heart collection had been featured for its Valentine's post "Cupid Strikes" - What an honor! Of the many wonderful indie blogs out there, this one is at the top of my list of favorites. It is nicely designed and is a cut above in its choices for great indie goodies. I want to thank Funky Finds and recommend that you check it out! Hey there Shalana, aka the funky felter! You have just been tagged by Aunty Shabby!! Love all your felted items!